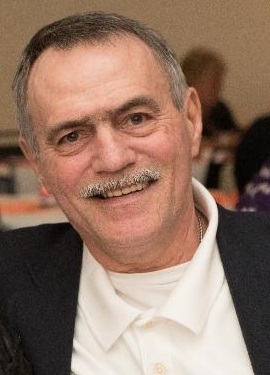 William E. "Bill" Myers, 64, of Bradenville died Wednesday April 10, 2019 at his home surrounded by his loving family. He was born May 21, 1954 in Greensburg, the son of the late William E. and Florence Armbrust Myers. Bill was a member of the Derry First United Methodist Church. He was a US Navy veteran having served from 1972-1975. Spending time with his grandchildren, music and singing always made for a good day. He had retired from Sony and Watt's Fuel Cells in Mt. Pleasant. In addition to his parents he was preceded in death by two sisters; Nancy Lee Emery and Eleanor "Tooty" McLean. He is survived by his loving wife of almost 43 years and best friend Linda M. Johnston Myers, his daughter Jennifer Burr (Josh) of Butler, his son Jason Myers (Nicole) of Latrobe, his sister Florence Blanche Hoggard of Ahoskie, NC, two grandsons, Brayden William and Ashton James Burr who called him "Happy". Brother- in-law James R. Johnston of Irving, Texas. Several nieces, nephews and his canine companions Mindy, Shelby and Lucy. Friends will be received Sunday from 4-8pm in the McCabe Funeral Home, 300 W. Third Avenue, Derry. A funeral service will be conducted Monday at 11am in the Derry First United Methodist Church with his pastor the Reverend Ron Emery officiating. (Everyone is asked to go directly to the church) Interment will follow in the Westmoreland County Memorial Park, Greensburg. Memorial contributions may be made to the church or Action for Animals. Online condolences may be made to www.mccabefuneralhomespa.com.